New version encompasses all arrows in the game, including Bound, Nord Hero and Dwarven Spheres/Centurions. Uploaded a Better Sorting compatible version. 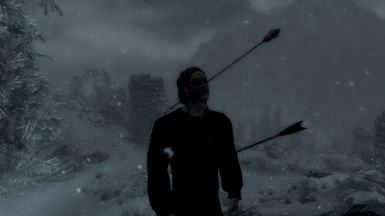 Uploaded optional version that raises Bound arrow damage to that of the Daedric arrow like it should. Initial Release. Currently all arrows in game have their damage output doubled. This is a small mod that increases the damage of every arrow in the game. I felt that taking an arrow to the face should have a better chance of killing someone. I wanted enemy archers in the game to be more of a threat instead of just a nuisance. It aims to not over-power archery, so it does not alter the damage of bows. Currently, it simply gives a significant damage boost to all arrows (except darts from traps) while maintaining, and improving, the balance. Completely new esp files for each version. Hopefully this will fix the issue with it unticking in NMM. 2. Once download finishes, double click the mod and NMM will do the rest. 1. Choose a version to download and download it using the manual option. 2. Extract the contents of the file into the Data/ folder found in your Skyrim installation directory. 3. Activate the ESP file in the DATA FILES option in the Skyrim Launcher. Play the game. Twitter page in the making so you can follow and get updates if you want! If you like this mod: support it, share it, endorse it! Thanks!